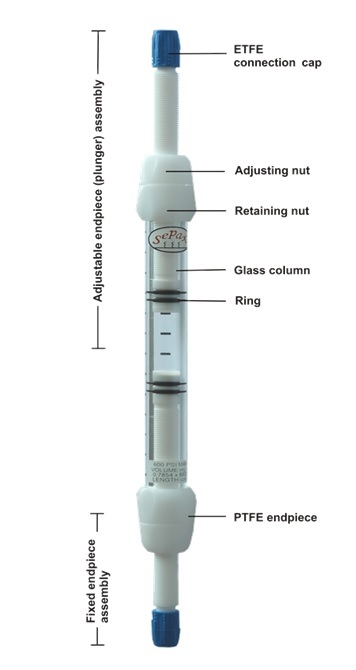 FPLC Empty Columns Sepax Technologies, Inc.
A ready-assembled column of -FF, -AF or -AA configuration, comprising a glass tube of the required dimensions pre-assembled with 25µm PE frits. Chemical stability: Resistant to aqueous solutions and most solvents used in liquid chromatography. Not resistant to acetone, ketones, chlorinated hydrocarbons, aliphatic esters, phenol, >10% NaOH, > 10% HCl, > 5% acetic acid, or strong mineral acid.